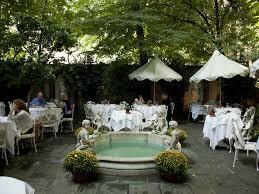 The garden of Barbetta - nothing changed, only a few new waiters. In 2001 I threw my engagement party in Barbetta - I try to go every summer to the garden. One needs to keep traditions alive.